In this file photo Environmental Protection Agency (EPA) Administrator Scott Pruitt attends a meeting between US President Donald Trump and carmakers in the Roosevelt Room at the White House in Washington, DC. A woman recently confronted Pruitt at a Washington restaurant on July 2 and called on him to resign -- the latest time an official from President Donald Trump's administration has come under fire while dining out. WASHINGTON – Scott Pruitt, who resigned as head of the Environmental Protection Agency in July amid numerous ethics scandals, is in talks to work as a consultant for a Kentucky coal-mining company, according to a story in The New York Times. Pruitt was a champion for weakening clean air and water regulations that affect coal mining and other fossil fuel industries while he led the EPA. He is in discussions with Kentucky coal mining tycoon Joseph W. Craft III, CEO of Alliance Resource Partners, about becoming a consultant, according to the Times. The newspaper reported that Pruitt, when he was still EPA administrator, met with Craft numerous times. Craft provided Pruitt with courtside seats at a University of Kentucky basketball game in December, the story says. 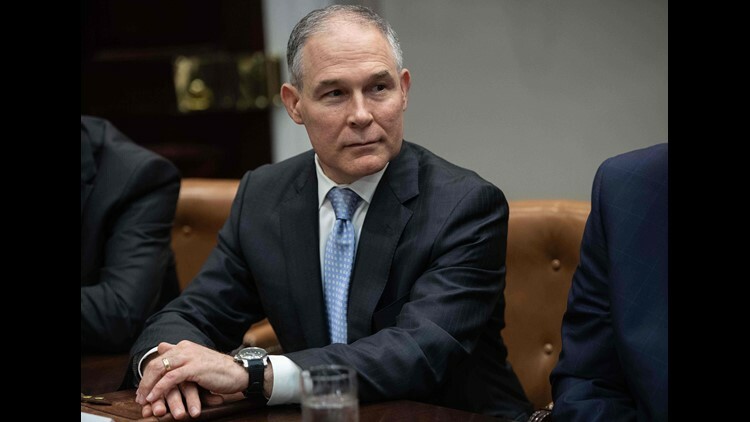 President Donald Trump required Pruitt and other top administration officials to sign a pledge not to lobby the federal government for five years after leaving. But the agreement does not bar Pruitt from giving advice to companies about the EPA or about state environmental agencies. He was Oklahoma's attorney general before joining the Trump administration. While he was head of the EPA, Pruitt was accused of spending extravagantly on travel and security, asking aides to run personal errands and getting a special deal on a condo rental owned by the wife of an energy lobbyist. The Government Accountability Office, which acts as the watchdog agency for Congress, concluded this year that the installation of a $43,000 soundproof telephone booth in Pruitt's office violated congressional appropriations law. Pruitt accumulated up to $300,000 in personal legal debts in 2017, according to a financial disclosure report that the EPA released Wednesday. The report did not specify why Pruitt was seeking legal help. In addition to his ethics problems at the EPA, Pruitt has been under investigation by the Oklahoma Bar Association for a possible ethics violation in the state. Pruitt speaks during the daily press briefing at the White House on June 2, 2017. President Trump shakes hands with Pruitt during a Rose Garden event where he announced that the U.S. is withdrawing from the Paris climate accord on June 1, 2017. Pruitt shakes hands with coal miners during a visit to Consol Pennsylvania Coal Company's Harvey Mine in Sycamore, Pa., on April 13, 2017. EPA Administrator Scott Pruitt does a television interview in Statuary Hall at the U.S. Capitol before President Trump delivers a speech to a joint session of Congress on Feb. 28, 2017. Trump shakes hands with Pruitt before signing the Waters of the United States executive order on Feb. 28, 2017, in the Roosevelt Room of the White House. Pruitt is presented with a baseball hat by Acting Administrator Cathrine McCabe at the EPA headquarters on Feb. 21, 2017, in Washington. Supreme Court Justice Samuel Alito shakes hands with Pruitt after swearing him in as the Environmental Protection Agency administrator in the Eisenhower Executive Office Building on Feb. 17, 2017. Holding the Bible is Marlyn Pruitt, wife of Scott Pruitt, and their son Cade Pruitt is standing second from right. Oklahoma Gov. Mary Fallin talks with Pruitt as she arrives for her annual State of the State address in Oklahoma City on Feb. 6, 2017. Pruitt waits at the start of his confirmation hearing before the Senate Environment and Public Works Committee on Capitol Hill on Jan. 18, 2017. Pruitt is welcomed on Capitol Hill on Jan. 18, 2017, by Senate Environment and Public Works Chairman John Barrasso, R-Wyo., prior to testifying at his confirmation hearing before the committee. Ben Carson, Trump's nominee to be secretary of Housing and Urban Development, and Pruitt walk outside the Eisenhower Executive Office Building following meetings on Jan. 13, 2017. Pruitt visits the office of Sen. Shelley Moore Capito, R-W.Va., in the Russell Senate Office Building on Jan. 4, 2017. Pruitt arrives at Trump Tower in Manhattan on Dec. 7, 2016. Pruitt speaks to opponents of the Affordable Care Act outside of the Supreme Court on March 4, 2015. Pruitt, newly elected attorney general for the state of Oklahoma, gestures as he speaks at a victory party in Oklahoma City on Nov. 2, 2010. His wife, Marlyn Pruitt, is at right.